To round out November, I'm going to go over Evangelion 2.0, the second part of the Rebuild of Evangelion tetralogy by Hideaki Anno that continues the story of Shinji Ikari. 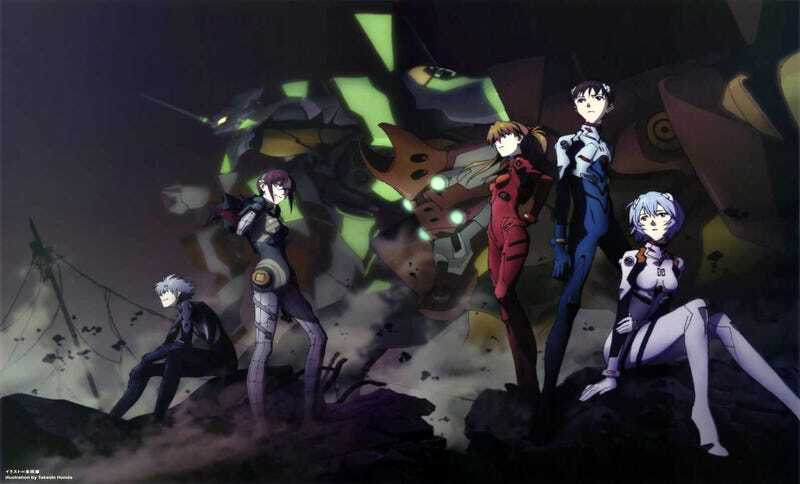 In turn, it is a remake of the Neon Genesis Evangelion series of the 1990's. I previously reviewed Evangelion 1.0 here. Be aware that spoilers for the first film might be present here (depending on your definition of spoilers), so you should avoid this until you've watched that. Evangelion 2.0 continues the Rebuild of Evangelion tradition of making all the characters on the show way more relatable. It is really a stark contrast to compare the characters of Evangelion 2.0 and Neon Genesis. A minor detraction is that a portion of the cast has been downgraded from their important roles of the TV series, but the main characters' new personalities make it just fine with me. I'll say it right up front, I love the new Asuka exponentially more than the previous rendition of the character. One of the reasons I disliked her in the TV series was because she had incredibly vapid mood swings between social and absolute depression-ridden wreck. In this film she gets better, way better. Instead of being social, she tends to more dedicated to her job than anything, and I think it suits her infinitely better. Rei is more believably receptive to Shinji's attempts to get to know her. She even manages to show off some social initiative this time around. Speaking of, Rei and Shinji's relationship once again takes the center stage in the film. While I still can't get behind this (I still think this is creepy), it makes the film seem a lot more... human in many respects. While the Evangelion franchise takes pride in its ability to rip apart the genre, it tends to be a bit lacking in humanity. It is one thing to deconstruct a genre. It is quite another to deconstruct a genre and make it feel real. By adding the human element, I think the viewer has something to hold onto while we get dragged through the brutality. Lastly, the extremely brief look into the geopolitical politics of EVAs and how exactly that works was strangely insightful. I almost wish we could see more of that, but we only have so much time to spend here. This film makes the jump and almost completely abandons the story line of the Neon Genesis Evangelion and reformulates itself into a glorious new package. This is a new beast indeed, and a very good one at that. Now that it isn't constrained by the compression pains of retelling the original series, the plot is far better paced and it fully embraces its individuality. With a new plot, the writing definitely sees an uptick here in almost every way. In addition to the better pacing, the character dialogues only got better too. I felt that the characters were made even more relatable because the dialogues this time around are even better. Of course it would be amiss to not mention that the famous Evangelion brutality is on full display this time around. The EVA fights are extremely brutal and somewhat painful to watch unfold. Anno never misses a chance to screw with the audience by hurting the far more relatable cast. One of the angel fights involving Asuka (yep, that one) is absolutely horrifying. Thanks Gendo! This, of course, leads to a few very gruesome scenes with equally gruesome subtext backing them. It is definitely easy to see how Shinji is capable of completely losing it in the film, I doubt very many people could handle it. It would also be amiss to not mention that the final moments of the film are built to tear you apart as well. As you cheer on Shinji believing that he's finally managed to pull himself together and he's very nearly "won the day" so to speak, it manages to smack you across the face and systematically rip you apart for believing that this trope is capable of being played straight. What? Did you forget this is a deconstruction? The pacing of the film might have accelerated too much for the casual new Evangelion viewer. If you haven't been a fan of Evangelion, certain elements and jargon that the series mentions might dramatically fly over your head. The plot is paced better than the previous film, but it still seems like we're in a bit of a rush on some level. It definitely feels like almost too many angel fights have been crammed into this bad boy. Interestingly, I thought the movie's soundtrack was very forgettable. It really was. Compared to the television series and even the previous film, I thought this was a low point. The only exception to this was the end credits music and it wasn't nearly enough to shift this up into the neutral zone. Lastly, this film does nothing but make Evangelion's fascination with Space Magic1 worse. At face value, it is science fiction, but when you watch you realize that everything is pretty rooted in magic. (1): Space Magic is my definition for exploiting a plot device to make anything possible. I initially called this Prophecy Syndrome after Indigo Prophecy, but this was altered after I encountered Mass Effect's ending. Seeing it so skillfully make use of this definition years after I coined it, it was only right to alter the terminology. A great sequel to the somewhat average Evangelion 1.0, which had problems in pacing and the storytelling. It is a great remake of the Neon Genesis Evangelion series that boldly diverges from the source material in all the right ways. I don't think we could have asked for anything better than this, we got something here that ensures that, at the very least, Rebuild of Evangelion will be memorable for its wish to be a new beast. This is, of course, best for those that want a brutal deconstruction of the giant mecha genre. The plot is good in its own right and it is almost a unanimous improvement in every way over Evangelion 1.0 and (arguably) the original Neon Genesis Evangelion. Evangelion 2.0 is not available for streaming because it is a film. As usual, I claim no ownership of the images herein. Nothing on tap right now. I'm actually out of things in the reviewing pipeline as I finish up Gundam SEED. Keep in mind that at least three series I'm watching for fall will end in December, so I've certainly got plenty on the way. This is part of my Anime Review Marathon that I began in October 2013 to record my thoughts as I watch a variety of anime on my ever growing backlog. These reviews won't come out on a consistent basis, they'll come out when I feel I have seen enough of a series to pass a judgement on it, although usually I will finish the whole series before the review. You can see all my articles on Dex's Corner.